In Part 1 of our Oculus Rift beginner’s tips series, I’ll provide both new and potential Rift users with some easy guidelines for making the most of your setup while avoiding some early mistakes that I made after purchasing the Oculus Rift for exercise in August 2017. In Part 2, I’ll discuss adding sensors for full room-scale capability, what to do with cords, and look at some of the more dynamic 360-degree titles you can purchase on Steam. When it comes to creating an optimal fitness environment for your Rift, there are a few basic factors to consider. We’ll be discussing the $399 Oculus + Touch bundle that comes with two sensors designed for a front facing only play area and take a tour of the Oculus Store. You’ve bought your shiny new headset and are ready to plug it in. Given that it’s a peripheral for your computer, it’s logical to connect it where your computer is already situated. If you intend to be active with your Rift, you’ll quickly learn that this may not be the ideal location. Our computers are normally confined to the corner of a room, with desks, chairs and other furniture around. This can be a terrible location for virtual reality! You need room to move around, and you need to be clear of desks, monitors, speakers and other equipment. Look at my ‘before’ and ‘after’ photos, to see how little room I had originally, playing in a tiny bedroom space, to having cleared a large space in my lounge for an unobstructed and far superior play experience. Be prepared for a rethink on where your computer needs to be. I’m stating the obvious, but exercise causes sweat. The Oculus was originally designed for seated experiences and consequently is not really designed to accommodate this. Your face makes contact with the headset via a non-removable foam padding that both absorbs your sweat like a paper towel, and can be uncomfortable to boot. A few weeks of sweating into that and it will not only stink but is likely to become home to all kinds of bacteria. A facial interface with removable padding that you can wipe down between sessions is essential. The best covers are made by VR Cover, and I’d consider one of these to be the first accessory you buy. 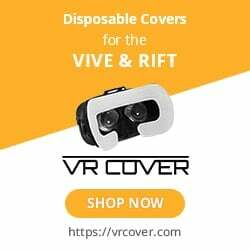 Note that the VR Cover comes, not only with a faux leather pad for easy wiping but also a machine washable cotton cover for those extra intense workout sessions. Protecting your headset from sweat is really important, so also invest in a sweatband and make sure you wipe everything down with anti-bacterial wipes after use. Thanks to the financial clout of its parent company Facebook, Oculus Studios have invested hundreds of millions of dollars into game development, resulting in a raft of high quality and exclusive titles. Lone Echo and its multiplayer companion title Echo Arena were voted Best VR Game and Best Multiplayer Game respectively, across all VR platforms by UploadVR in their 2017 awards. Further exclusives such as Robo Recall, Arktika 1, Wilson’s Heart and The Climb, mean that the Rift has titles to appeal to everyone. Although not fitness titles in a strict sense, the games mentioned above are played standing and involve some pretty intense action, so they are a great place to start. Oculus frequently has multiple seasonal sales, daily deals, and various bundled game collection offers. Meaning if you buy strategically, you will never have to pay full price! Don’t worry if you miss a sale, they come around again very quickly! They also offer an automatic refund policy on games played for less than two hours, as long as you return within 14 days. Now it’s time to get down to business and select the best fitness titles available on the Oculus store. These titles require a two sensor, front-facing setup. We’ll look at 360-degree room scale titles in Part 2. Punch and squat your way to fitness, with the awesome boxing cardio title BoxVR! Voted VR Fitness Insiders’ Best Fitness title of 2017, this game is designed to work your entire body with a variety of punches, ducks, blocks, squats, and lunges. The music is excellent or you can use your own! Also, consider Knockout League, an arcade Punch-Out style boxing game where you fight a variety of wild and frankly bizarre opponents, as well as get put through your paces in training sessions at the virtual gym. If competitive games are your bag then Sprint Vector, an intense arm-swinging, skating/parkour/Mario Kart hybrid thrill ride with an excellent multiplayer community is an essential title. Also consider Sparc, a futuristic dodgeball/racquetball game for more multiplayer competition. If you prefer to play sports, Eleven Table Tennis is an ultra-addictive re-creation of ping pong with physics so realistic you’ll forget you’re playing a game. It has a nice multiplayer community as well as excellent AI opponents. If you fancy a next level racquetball game, Racket: NX will have you rapidly hitting a virtual racquetball at different angles. Need More Beginner Oculus Info? Check out Part 2, where I’ll be discussing sensors, cords, full room-scale capability, and dive into more 360-degree titles for VR fitness!